Product prices and availability are accurate as of 2019-04-20 20:14:41 UTC and are subject to change. Any price and availability information displayed on http://www.amazon.com/ at the time of purchase will apply to the purchase of this product. The fastest, easiest way to design and print professional quality bar code labels. 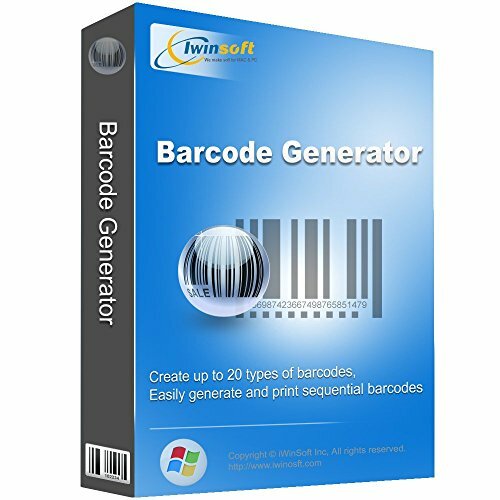 iWinSoft Barcode Generator provides powerful design, printing and database features that allows you to create any size of label with Barcodes, Text, Shapes, Images etc. It gives you the flexibility to meet your most demanding labeling needs. The powerful sequential numbers feature lets you generate sequences data freely, and besides, iWinSoft Barcode Generator also providers import barcode data from Text File. It has a built-in support for all major types of barcode symbologies like EAN13, UPCA, UPCE, Code 128 ABC, Code 39, Bookland, Codabar, MSI, Postnet, FIM Codes (3 types), Horizontal bars, ISSN, ISBN, Japanpost customer barcode, Interleaved 2of5 and etc. Designed for Windows. Supports more than 600 label paper templates, you can also define your own paper templates. Add the descriptive text and graphics to labels. It works as a stand-alone program on your Windows, and you can export Barcode images to other graphics formats such as GIF, JPG, PNG, TIFF, WMF, BMP etc. Easily create barcodes in sequential numbers.